MONTREAL—Two McGill University doctors who attended Shen Yun Performing Arts at Place des Arts on Jan. 10 were thrilled with the renowned production, which tours the world each season showcasing China’s 5,000-year-old culture. “It’s spectacular. It’s very beautiful,” said Marie St-Laurent, a doctor of psychiatry at McGill University Health Centre. Her colleague, François Patenaude, an oncologist, was equally impressed. “There is a large creativity course we also learn—all the multi-millennial history of Chinese culture, which is exceptional. Traditional Chinese culture is unique, which is unfortunately little known in the West, except when there are museums with exhibitions, all that. 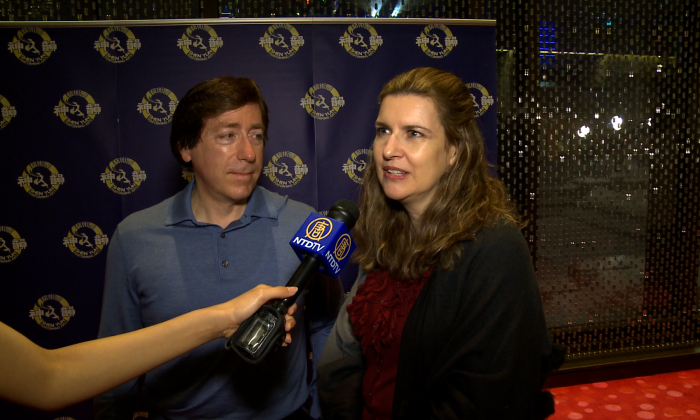 So for us [Shen Yun] is a discovery,” he said. At the heart of Shen Yun is classical Chinese dance, an ancient art form passed down through the ages in China that includes leaps, spins, flips, and tumbling techniques—moves that became popularized in the West as gymnastics and acrobatics, but originated in classical Chinese dance. “Grace, elegance, but also strength,” said Dr. St-Laurent. “It is a controlled strength. There really is a quiet power found in the grace, the elegance, as much for the men as for the women,” added Dr. Patenaude. “The women also demonstrate power with the jumps and spins,” noted Dr. St-Laurent. The Shen Yun Orchestra, with its unique blend of Chinese and Western instruments, also came in for praise.